How to import MXF files to iMovie from Canon XC10 XF-AVC 4K camcorder? How to edit the XC MXF files in iMovie smoothly with a perfect effect? If you are looking for a smooth workflow between Canon XC10 and iMovie, you are in the right place. The following article will present the easiest way to convert the Canon XC10 XF-AVC MXF footage to AIC MOV for iMovie. What’s new with this latest Canon 4K camcorder? Why we need to convert the MXF files for editing in iMovie? Well, Canon XC10 is a very hot camcorder on the market now, a lot of users choose to buy this excellent camcorder, it is a new camcorder with 4K internal video recording, which is aimed at beginners and semi-professionals who would want to upgrade to shooting 4K video without spending the big bucks for it, While as we often mentioned, as the incompatible one, MXF cannot be one of the best supported video formats for iMovie. How could we remove the troubles when editing Canon XC10 XF-AVC MXF recordings in iMovie? For those who need to edit Canon XC10 MXF files in iMovie, we would recommend transcoding XC10 MXF footage to AIC .mov before editing. AIC (Apple InterMediate Codec) is iMovie’s favorite editing codec, which iMovie will read and handle well. In this way, you can expect a fast and fluid workflow between iMovie and XC10 4K Camcorder. We here can highly recommend you to use UFUSoft MXF Converter for Mac/Windows, this is the best MXF converter on the market, it can work as 4K MXF converter to convert Canon XC10 4K MXF files, or other 4K MXF files. Read on to find a step-by-step guide talking about how to rewrap XC10 4K/HD MXF files to AIC for editing in iMovie natively. How to encode Canon XC10 4K/HD MXF files to AIC MOV for iMovie editing? 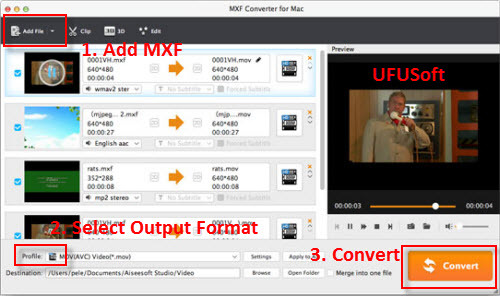 Step 1: Download, install and launch UFUSoft MXF Converter for Mac as a Canon XC10 Video Converter for iMovie. When its main interface comes up, click ‘Add File’ to load your source media. Step 2. 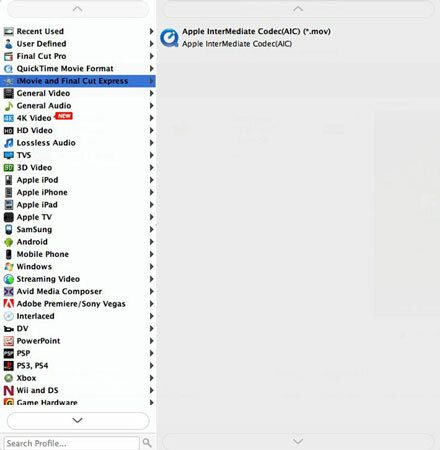 To convert XC10 MXF video for iMovie, from ‘Format bar’ list, choose ‘Apple InterMediate Codec (AIC) (*.mov)’ as output format under ‘iMovie and Final Cut Express’ column. This output format is also suitable for editing in Final Cut Express. Step 3. Custom video and audio settings (optional). If necessary, you can click ‘Settings’ button and go to ‘Profiles Settings’ panel to modify video and audio settings like video encoder, resolution, video bit rate, frame rate, aspect ratio, audio encoder, sample rate, audio bit rate, and audio channels. Step 4: Begin Canon XC10 MXF movies to AIC .MOV for iMovie Conversion on Mac. When ready, click ‘Convert’ to start format conversion. Once the conversion process is complete, you can click ‘Open Folder’ button to get the generated AIC MOV files for editing in iMovie with optimum performance after transferring the files to iMovie as usual. Let’s have a try! Posted in Convert MXF/P2 MXF Videos | Comments Off on How to Edit and Use Canon XC10 XF-AVC 4K/1080p files in iMovie on Mac?